Here we have a deceptively spacious coastal townhouse for sale in Residential Rocajuna – Punta Prima, walking distance to a wide range of services and amenities. The property makes up part of an established and well-maintained community which boasts: communal parking, a gated swimming pool which has recently been refurbished, plus beautifully maintained communal gardens. 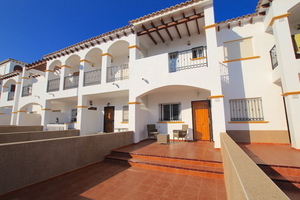 The property itself is both bright and spacious and has a true ‘Mediterranean’ feel to it. The current owner has carried out a lot of home renovations which has resulted in a quality and exceptionally well-presented 3 Bed / 2 Bath property which would be perfect for both holidaying and full-time living alike. The living and sleeping accommodation is set out over 3 floors – all connected via an elegant internal staircase. The ground floor houses: a spacious lounge-diner with a feature fireplace (Wood-burning insert), a stylish shower room, plus a larger than average kitchen with plenty of workspace and storage. From the kitchen you walk out onto a West-Facing patio which in turn has direct access out to the communal pool and gardens. The first-floor houses: a guest bedroom (double), a designer bathroom suite, a hallway with added storage / wardrobes, along with a large master bedroom with plenty of wardrobe space, along with a private sun terrace which boasts sea views! The second-floor houses: a 3rd bedroom with vaulted ceilings, a winter room / study, plus a secondary sun terrace where the sea and surrounding views are further enhanced. To the front of the property you have a wonderful sun-drenched patio along with a communal garden. The property is in excellent order and will be offered mostly-furnished including top-quality furniture, fixtures and fittings, modern aluminium shutters, double glazing with ‘twist and tilt’ and much more. 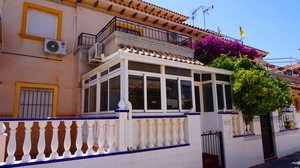 If you are looking for a traditional Spanish property within easy access to the beaches and numerous commercial centres and amenities, then this beautiful Rocajuna townhouse is for you! Punta Prima benefits from a range of amenities within walking distance, with supermarkets, bars and restaurants, as well as the new shopping centre opened up just down the road. The La Zenia Boulevard Shopping Centre has a great selection of shops and also bars and restaurants with sea views. Punta Prima is situated just a 30 minutes’ drive from the Alicante Airport and about a 20 minutes’ drive from the San Javier-Murcia Airport.